Summary: Most of us wish to get drenched in the shower of water and when it is a natural water in natural falls, our happiness will be doubled, isn’t? Ethipothala is a place located at a distance of about 11 kms from Nagarjuna Sagar Dam. This place is the home for a sprawling waterfalls called as Ethipothala Waterfalls. This waterfall is actually a mountain stream that falls down 22 metres for formation of a tranquil pond at the foot of the hill. The falls is actually a union of three small rivers called as Nakkala Vagu, Chandravanka Vagu and Tummala Vagu. The ponds around the falls are used for crocodile farming programme that is running under the control of the Forest Department of the state of AP. What is the reason behind the name of the falls? 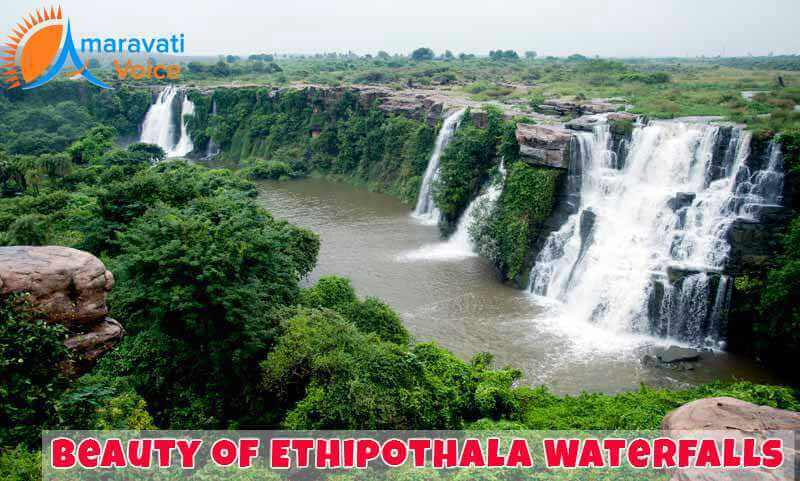 The story behind this falls states that yathis and rishis have done tough prayers in this place and so this place got its name as etitaposthal, which means the place in which thapam, a form of meditation was done by yathis. In Sanskrit, the term ‘iti’ gives the meaning of tapas, which means personal discipline or endeavour, which is done to achieve a goal. Yathi is a term that denotes the meaning of an individual, who works hard to achieve a particular purpose and this term is synonymous to the spiritual person called yogi or monk. The name ‘Ethipothala’ is given to two things in AP, one is this waterfall and the other is the government’s Lift Irrigation Scheme and this scheme is called as Ethipothala Padhakam. In Telugu, the term ‘Ethipothala’ gives the meaning as lift and pour. This is why many local people assume that this falls is a part of the Lift Irrigation Scheme of the government. But, it has nothing to do with this scheme governed by the local government. Also, since the Nagarjuna Dam is located close to the falls, it is obvious that people think that the falls is a part of government’s project. But, it is a tourist spot that is open for public. Besides this falls, Ethipothala is the home for two beautiful temples as well that are located close to the waterfalls. These temples are located in a valley that is surrounded by lush green forest. The temples are for lord Ranganatha and Dattatreya. There is also a network of caves close to the waterfalls and these caves start here and extend till Srisailam. There is also a Buddhist site close to the falls. The ideal time to visit this waterfall is summer evenings. The reason for this is that after the sunset, colourful lights start to decorate the falls. The cascade looks fantastic under lights. Haritha Resort is the most popular and affordable accommodation to choose and this is located in Nagarjuna Sagar area. From this resort, the tourists can get a magnificent view of the falls. There are both AC and non-AC rooms in this resort for the visitors to choose according to their budget. The grounds near the waterfalls also have the ideal place for mild trekking and camping as well.